Mykytka, Osyp, b 21 February 1878 in Zeleniv, Rohatyn county, Galicia, d August 1920 in Moscow. (Photo: Osyp Mykytka.) General officer of the Ukrainian Galician Army (UHA). Commissioned in the Austrian army in 1902, by the start of the First World War he held the rank of captain. In January 1918 he served briefly as commander of the Ukrainian Sich Riflemen. 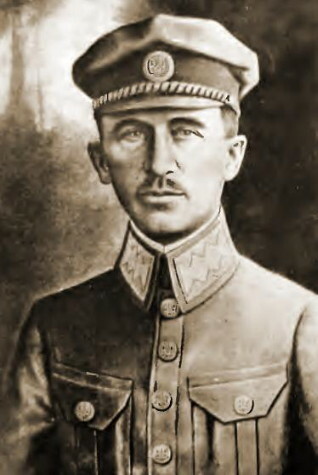 After joining the UHA he took command of its Stare Selo Group, in December 1918, and then, at the rank of major, of the First Corps of the UHA (formerly the Northern Group of the Ukrainian Galician Army), in January 1919. In May he was promoted to lieutenant colonel and in June to colonel. On 7 November 1919 he became brigadier general and replaced Myron Tarnavsky as the commander in chief of the UHA. Arrested by the UHA Revolutionary Committee, he was turned over to the Bolsheviks on 6 February 1920 and held for several months in a concentration camp near Moscow. After repeatedly turning down posts in the Red Army, Mykytka was executed.